With all of the excitement about the up and comers in the middle of the infield for the Atlanta Braves, the hot corner is a place that occasionally gets forgotten about, but does not lack talent. While third base is not as deep as some other positions in the Braves system, there are a couple of young ball players that will be knocking on the door of SunTrust Park in the near future. Those of you that read my post last week on the Braves top prospects at Shortstop know that I prefer to write about guys that are still coming up through the system when I am speaking in terms of “prospects”. The first name you will see on this list of third base prospects is a player that saw seven at bats in Atlanta in 2016, but we are not going to leave him off of this list for that. The 22 year old California product came to the Braves with Mike Foltynewicz from Houston in what was originally deemed as the “Evan Gattis Trade”. At the time, Ruiz was seen as a decent prospect in the Astros system that had the potential to blossom into a legitimate major leaguer down the road. After making the move to the Braves, Ruiz was assigned to Mississippi, his first taste of Double-A, where he spent the entire 2015 season. It was a tough year for Ruiz, both at the plate and in the field. He slashed .233/.333/.324 in 420 AB’s while making 16 errors in the field. 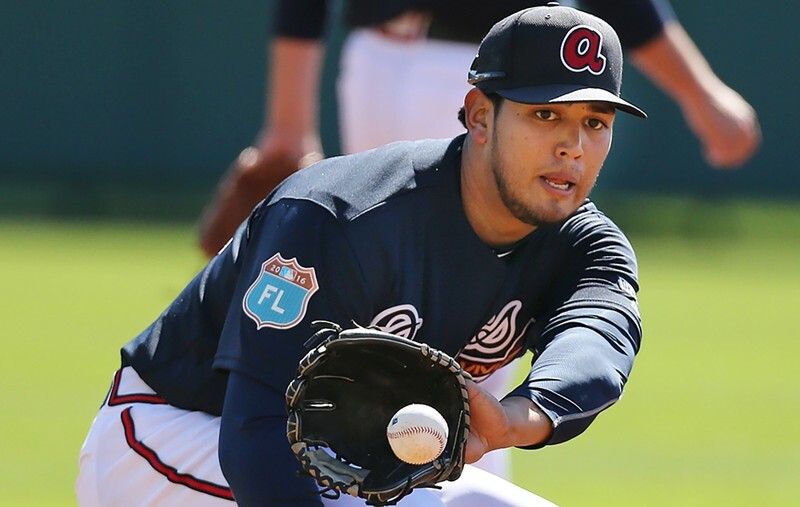 Despite the struggles, the Braves decided Ruiz was ready to be the everyday third baseman in Triple-A Gwinnett for 2016. He proved early and often that it was the right move as he slashed .271/.355/.400 and eventually earned a September call up for five games at the end of the 2016 season. Ruiz is very close to big league ready and may take over the hot corner at some point in 2017. The highest regarded third base prospect on the farm, Riley is rated as the thirteenth best prospect in the Braves system and the eighth best third base prospect in baseball, according to mlbpipeline.com. The 19 year old out of Southaven, Mississippi could have been taken as a pitcher or a position player out of high school in the 2015 draft. He crushed rookie ball in 2015 where he slugged .544 between GCL and the APPY League. His 2016 in Rome was a tale of two halves as he got off to a slow start but finished strong during the team’s championship run. He proved that he can mash the ball, the Braves just look forward to seeing if he can put together a full season of it. He hit 20 HR’s and slugged .479 in 495 at bats last year. The power numbers were very good considering he was a teenager, but they were accompanied by 147 strikeouts and very poor defensive play. With that being said, it is important to consider where Riley is in his progression. 2017 will be all about whether or not he can put up a consistent season and lower the strikeout rate. There are still a lot of unknowns around Luis Mejia, mainly because he has spent his first two seasons in some form of rookie ball. What we do know is Mejia is a sure infielder who has split time at second, short and third both years of his professional career with the majority of his starts coming at the hot corner. He signed as an international free agent in January 2015 at the age of 17 and was set to play the upcoming season in his home country in the Dominican Summer League. A high contact, low strikeout kind of hitter, Mejia slashed .282/.376/.330 while striking out only 25 times in 209 at bats during the summer of 2015. He was not an everyday starter last year in the Gulf Coast League, but still managed to be productive even though his at bats had been cut almost in half from the year before. Mejia is a defensive standout that can play anywhere in the infield and the Braves look forward to seeing if his bat can catch up to the glove as he moves up in the system.